moments after wolfgang was born arick noticed that his left eye was not completely open. the pediatrician on staff at the hospital told us this was normal since he was brand new and it eventually would open. sort of how it takes a few days for a puppy's eyes to completely open ... or at least that is how i took it. well, a few days passed and we took him home and his eye still did not open completely. after seeing our primary pediatrician we learned that he has marcus gunn phenomenon. what this means is while wolfgang is nursing or actively moving his jaw, his left eye will move to the rhythm of him sucking. he also told us he has ptosis, which is a drooping eyelid. not to be confused with lazy eye. wolfgang does not have a lazy eye. we were referred to an ophthalmologist who gave wolfgang the same diagnosis. we see his ophthalmologist, dr. liston, every three/four months to make sure his ptosis is not affecting his vision. sometimes ptosis can cause one to favor their other eye which can lead to lazy eye. so far, this has not happened. we just saw dr. liston last week and go again in january. if his doctor notices any stigma as a result of him favoring his other eye, wolfgang will need glasses. 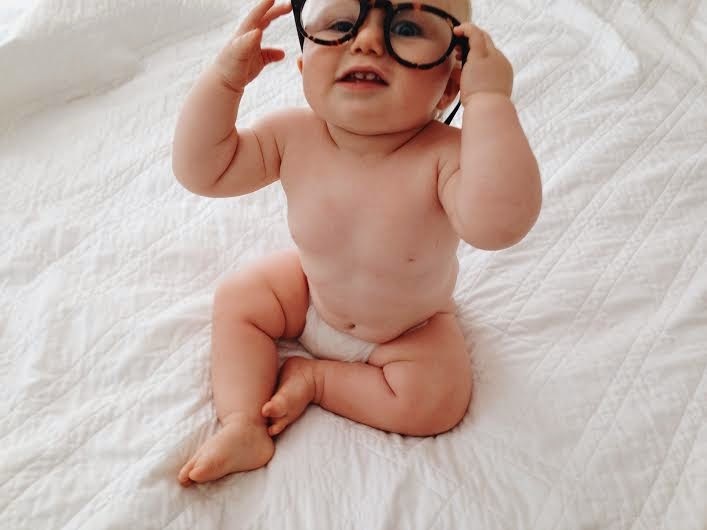 we are hoping he will not need glasses as an infant because man, it would be so hard to keep them on! here he is being silly with mama's glasses. if you look closely, you can see his ptosis.